The history of The Lake County Aikikai, The Chicago Aikikai, and Charles Tseng Sensei are intertwined. Tseng Sensei was born and raised in Taipei, Taiwan. He studied at Taiwan University, and then came to the United States for his graduate study at Northwestern University and the University of Pennsylvania. As a student, Tseng Sensei studied T'ai Chi in Taiwan. While attending the Ginza Festival in Chicago during August 1970, Tseng Sensei saw an Aikido demonstration given by Takahashi Sensei. His interest prompted him to join the Illinois Aikido Club (now The Chicago Aikikai) in Chicago during September 1970. 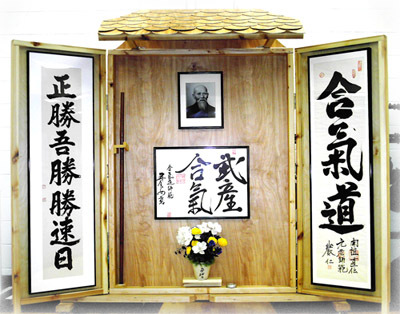 In January 1972 Tseng Sensei visited Hombu dojo where he met Akira Tohei Sensei and Fujida Sensei. Tohei Sensei was invited to instruct at the Illinois Aikido Club in April 1972. Three years later Tseng Sensei received the rank of Shodan from Tohei Sensei. Charles Tseng Sensei started his dojo which became known as the Lake County Aikikai in September of 1975 at the Lake County YMCA in Mundelein. Over the years he has actively recruited his students including many who came from his place of business. His first lesson began with a class of 15. In December of 1975 Tseng Sensei traveled with 10 people from the Illinois Aikido Club to visit Saotome Sensei during the Sarasota, Florida winter camp. This event was the illinois Aikido Club's first contact with Saotome Sensei. In May of 1976, Saotome Sensei visited the Lake County Aikikai at the YMCA in Mundelein. his Godan rank. Charles Tseng Sensei currently holds the rank of Rokudan (6th degree black belt) which he recieved in 1998. Today the Lake County Aikikai is still located at the College of Lake County. The Aikikai continues to grow with 20-30 new beginners each semester.